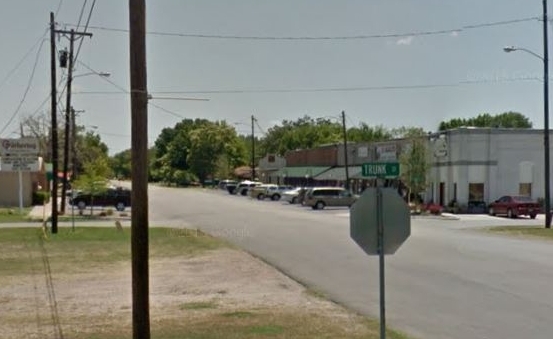 It was at East Church Street and South 4th Street in Crandall, Texas where Eugene Grizzard was sitting with Velma Davis and witnessed Clyde stealing his car. House as it looks today. Red dot shows where Love birds, Eugene and Velma were sitting. Still on the right shows actor Gene Wilder diving over the ledge onto the lawn. Corner of South 4th and East Church As Velma and Eugene turn corner to chase down the car thieves. above movie stills are from Warner Bros."Bonnie and Clyde." 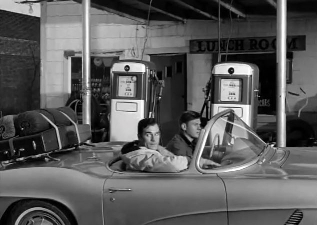 Seen in Route 66 "1800 Days To Justice" starring George Maharis and Martin Milner. 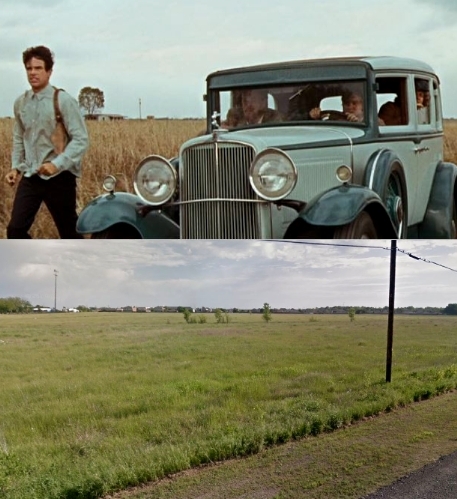 In the Warner Bros. movie Bonnie and Clyde, you see Beatty and Dunaway leave what was supposed to be Arcadia, Louisiana after spotting the laws. They then drive off into the ambush. 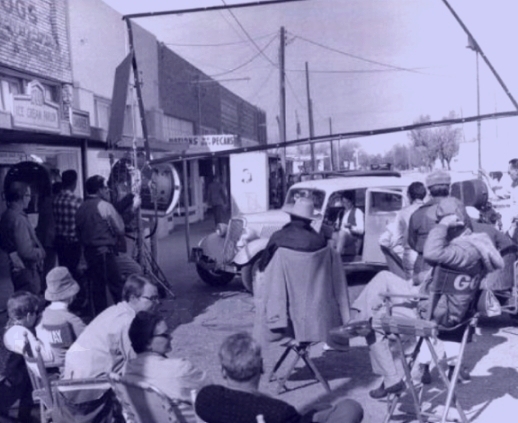 That scene was filmed on South Main Street in Crandall, Texas, where you can see the old Harcourt Bank building in the background, That building is currently home to Crandall Salon & Day Spa. In the 1999 film "Boys Don't Cry" Starring Hilary Swank, the same building is seen when the car full of youths drive into town. 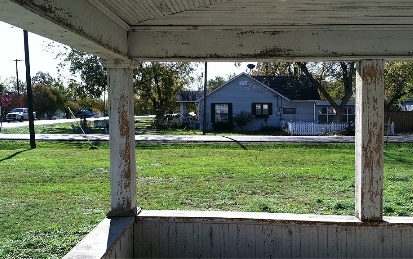 South Main Street in Crandall, Texas served as Arcadia, Louisiana for the movie. The store front to the left shown in right photo had served as "Arcadia's Dept. of Water and Power" seen in Warner Bros, "Bonnie and Clyde." 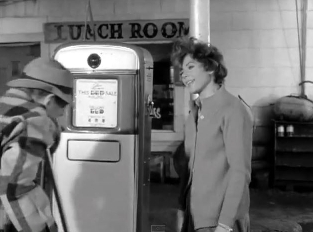 still from Warners Bros. Bonnie and Clyde on the left and television's "Route 66" episode on the right. Behind the scenes still from Warners Bros. Bonnie and Clyde. Left still from "Boys Don't Cry". View as it looks today is the on right. Left still from Warner Bros."Bonnie and Clyde." View as it looks today is the on right. above left stills from television's "Route 66" episode. View as it looks today on right. 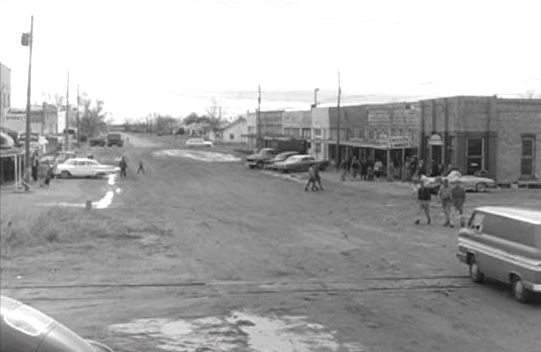 Since the time this episode of Route 66 (1962) and Warner Bros. Bonnie and Clyde (1966) filming, the other side of South Main Street has vanished. The scenes below are from both filmings. You can see the Fire Department in the background in both, "Route 66" and "Bonnie and Clyde." Also, in the still, below right, you see the taller building before it was destroyed by fire. 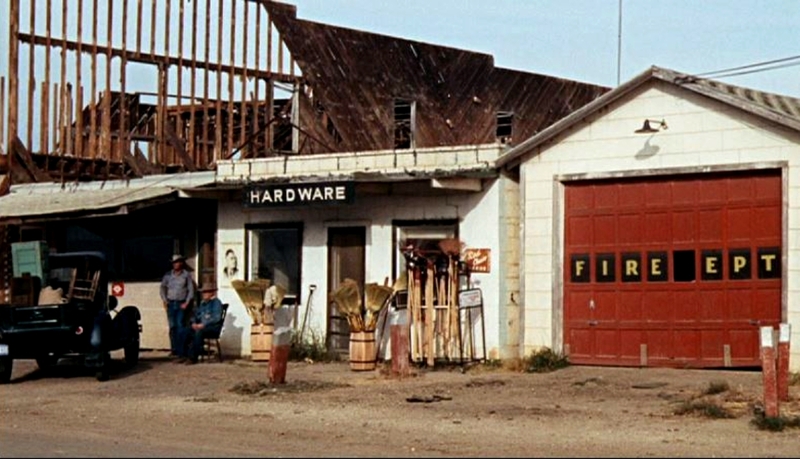 It also shows the hardware store from the "Bonnie and Clyde" movie. above left and right stills are from television's "Route 66" and middle still is from "Bonnie and Clyde." Same taller building seen from other angles. 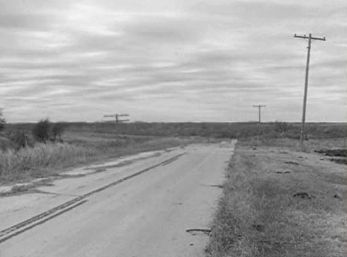 above stills are from television's "Route 66"
South Main Street in Crandall, Texas. This section of town can be seen in several movies throughout the years, including the Warner Bros. movie, "Bonnie and Clyde." 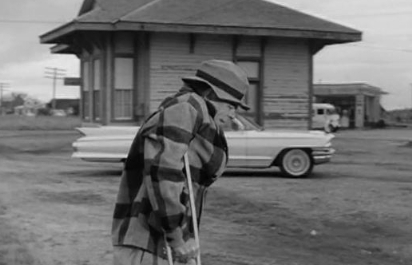 In 1970's "A Bullet for Pretty Boy," a bank robbery was also filmed here. The bank that got robbed in that movie, is now home to the "Crandall Salon & Day Spa." stills from "A Bullet for Pretty Boy" and the same view today. 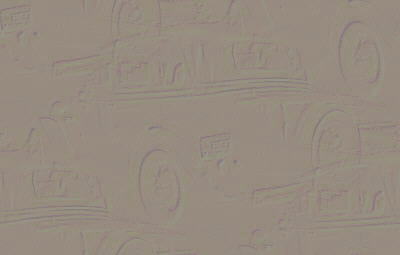 In the "1800 Days" episode of Route 66, you can still see when the trains crossed over South Main Street, even in 1966. The train comes through and stops by the railroad depot near the white filling station. You can see the R.R. Crossing signal in the still (below left) if you look in the area just above the black truck's trunk. The train track would have been located between West Holly Street and East Trunk Street, which both cross South Main Street. stills above are from "Route 66"
still on left is from "Route 66" and the same view today is on the right. 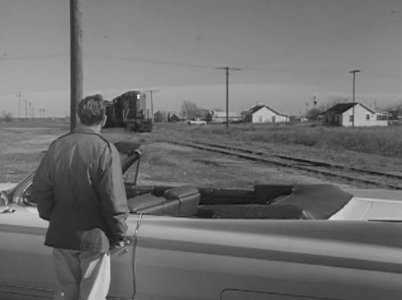 above movie still is from television's "Route 66"
Same stretch of West Trunk Street was also used for the scene where the Barrow gang get followed by victims Eugene Grizzard and Velma, after they make off with his car while the two were necking on the porch. Image below shows the the two young lovebirds, turning around, after thinking twice about persuing the possibly dangerous car thieves. 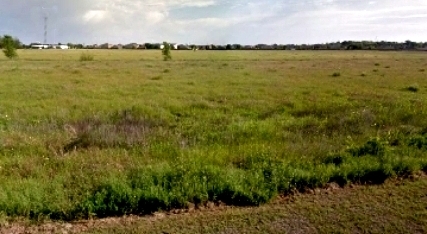 Note the Crandall, Texas water tower spotted in the, not too far distance. It can be seen in several shots during filming. Barrow gang decide to turn around and chase after the young couple. 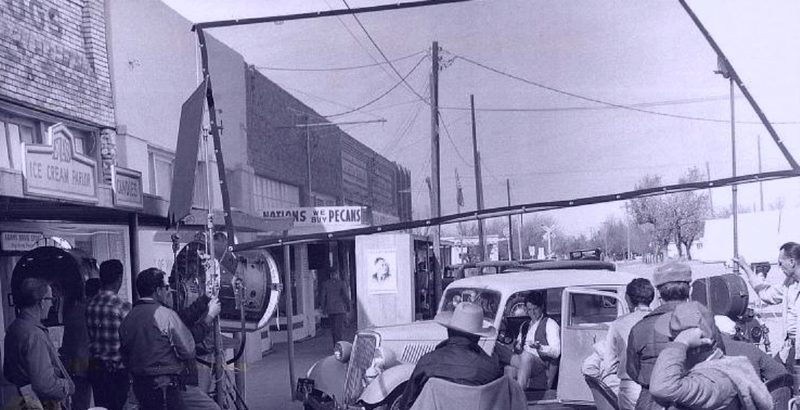 Seems the exact spot, shown in the Route 66 filming below, was used by film makers again in 1966, below left. still above left is from "Route 66"
still above left is from Warner Bros. "Bonnie and Clyde"
still above is from Warner Bros."Bonnie and Clyde"